While looking for information on Cladun: This is an RPG, which was mentioned a few times in my last post, I came across a recent post (it was published in mid-May) on siliconera.com that suggests that game's sequel will be released stateside in August. Although l'd rather see the folks at NIS America pull a What Did I Do to Deserve This, My Lord!? 2 and release both Cladun titles on a single UMD, I understand why they decided not to go that route. 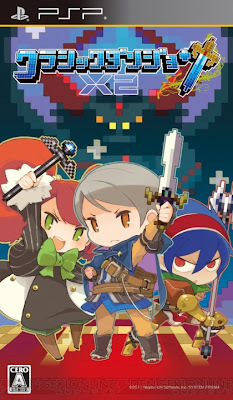 Regardless, I plan on rewarding the company for its continued support of the all-but-dead PSP with my hard-earned cash as soon as Cladun x2 arrives on the PlayStation Store in August. Very sad that it's download-only yet again. The collector in me is in pain. Still! Better than not getting it at all. It's funny because people keep mentioning how the PSP is dead, and yet I've bought more PSP games than anything else this year! I guess it's inevitable with the reveal of the Vita, but still. I hear you, Kamiwoo. Honestly, if the first Cladun and and Patchwork Heroes had been released in stores/on UMDs, I'd have bought them now. That said, I'll eventually take what I can get (i.e., like you said, it's better than getting nothing at all). I also hear you RE: the PSP being dead, BTW. Honestly, though, the system has *always* been dead in the States. In Japan, though, it's a completely different story. Hell, it's the best-selling system of the year -- or nearly the best-selling system of the year -- in that country right now! What PSP games have you bought so far this year, if you don't mind me asking? I'm planning to pick up quite a few of them later in the year -- after I get birthday money, etc. :) Hopefully by then some of them will have bargain-basement price tags. Oh, one last thing: Have you enjoyed what you've experienced of the first Cladun? Let's see... this year alone, I've gotten Tactics Ogre, Final Fantasy IV Complete Collection, Gods Eater Burst, Dissidia 012, The 3rd Birthday, and Half-Minute Hero, among others I'm probably forgetting! My PSP is my second-most-used console besides my DS right now. I know it'll always be in the DS' shadow, but it's been a great source of portable RPGs for me. Which are my personal favorite kinds of games. Cladun is fun, but I think I spent more time trying to create a cool-looking custom character than actually playing! Luckily there are preset characters to choose from if you don't want to fiddle with that. From what I remember playing, it was a solid, fun experience with a remarkably good soundtrack. Pretty much everything I was expecting from the game and then some. Unless I'm completely off-base, I think you'll enjoy it! Oh, that's definitely a good list of PSP games, Kamiwoo! I definitely plan on adding some of them -- FFIV Complete Collection, Half-Minute Hero and Tactics Ogre, especially -- to my PSP collection eventually.